Here is an interesting new title from Max Decals - their first book actually - looking at the Fouga Magister. It is subtitled 'An Irish Perspective' and when you read through the book, you get a really unique love-hate relationship that this aircraft had on the Irish. Produced in France by Fouga, the endeavor was picked up by another well-known French aircraft company - Potez. The Irish government had evidently invested in the Potez company and some of the innovative aircraft that were planned, but the story reads like many of the headlines out of today's government investments within the United States. In another bit of irony, the first exposure that the Irish military had of the Magister wasn't from the cockpit, it was while being straffed and bombed by an alleged mercenary Belgian pilot while performing UN peacekeeping duties in Africa. A lone Magister from the Katangan Air Force had been converted in the field with improvised weapons. It was certainly an interesting introduction to the versatility of this French-made trainer and the first time the Irish Army had been attacked from the air. To further the irony, two of the used Magisters that would enter service with the Irish Air Corps were from the former Katangan Air Force! This story is brought together by Joe Maxwell of Max Decals and Radu Briznan and provides a very interesting insight into the history of the aircraft, the history of the aircraft in the Irish Air Corps from the time it replaced the venerable Vampire until it was replaced itself by more contemporary aircraft. The title is very well illustrated with color photography of the aircraft in operations, and even color profiles of the aircraft in Irish service. 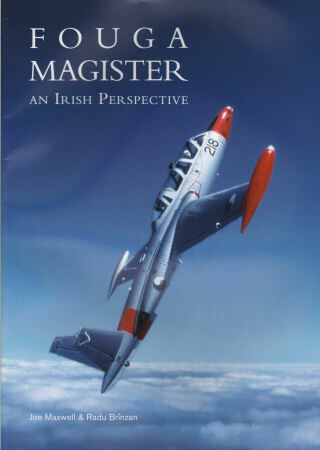 A section dedicated to maintenance on the Magister is also well illustrated with close-ups of various details around the small trainer, There is even a chapter with great coverage of the award-winning aerial demonstration team - Ireland's Silver Swallows. This is a great title for aviation buffs as it is a great read as well as an interesting insight into aviation irony, and for modeler's this is also a great reference for transforming the venerable FM 1/48 or Airfix/Heller 1/72 scale kits into detailed models whether you add the Irish markings or those of many other operators of this type. You can order this book directly from the publisher at maxdecals.com.